Here is a compilation of Snowboarding Companies and their Information. SIA or Ski Industries of America Snowboarding Directory. "BRANDS: Links" at the bottom of each companies listing. FA Design Outerwear Founded in 2009, FA design was created to expand the technical horizon for snowboard specific outerwear. By using only the highest performing materials in combination with highly advanced production methods, we were able to take the traditional garment light years ahead. Constantly pushing beyond “state of the art’’ we merge both form and function from the conception of every design. Through purposeful, functional, and sophisticated designs, we aim to enable the user to experience the feeling of true connectivity. 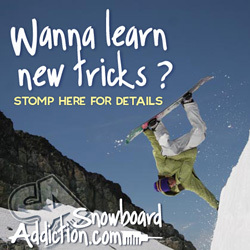 To receive Snowboard Coach News. Your address will be safe and shared with no one. Skullcandy, Inc. Member Since 2005 1441 W Ute Blvd, Suite 250, Park City, UT 84098 P: (435) 940-1545; F: (801) 601-3735 E: info@skullcandy.com; W: www.skullcandy.com Description: Skullcandy is the original lifestyle and performance audio brand inspired by the creativity of youth culture. Skullcandy designs, markets and distributes audio and gaming headphones and other accessory related products under the Skullcandy, Astro Gaming and 2XL brands. Skullcandy was launched in 2003 and quickly became one of the world’s most distinct audio brands by bringing unique technology, color, character and performance to an otherwise monochromatic space. Personnel: Amanda Schaefer (Marketing Events & Brand Initiatives Manager) Brands: Skullcandy™® Equipment: Audio/Headphones/Accessories Supplies and Services by Category: Original Equipment Mfg. (OEM) Additional Products and Services: Personal “lifestyle” electronics - LINK mobile phone/music source headsets, headphones, MP3 players, MP3/voice record watches. Technine All started in 1994 in Avon, Colorado, where a group of 18 Y.O. kids were trying to realize a new kind of binding that later would be globally known as Baseless. The new idea worked real good and the company quickly grew, becoming a symbol of strength and quality when it comes to talking about snowboard bindings. Clothing and snowboards were implemented later to give a proper kit to all the street slaughters and hip hop heads out there.